Today is the first day of French Fridays with Dorie, an awesome new group dedicated to baking through Dorie Greenspan's new book Around My French Table. 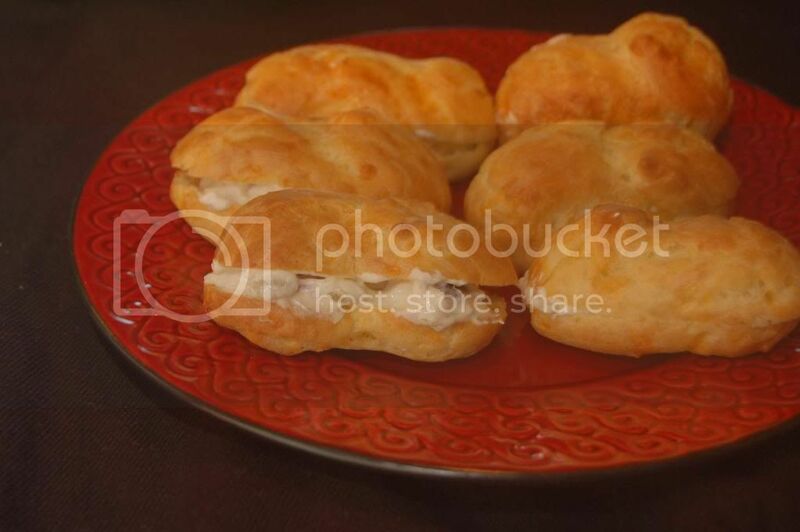 Dorie choose the first recipes and todays, Gougeres, are absolutely delicious (no surprise there!) Gougeres are made just like cream puffs (a quick and easy stove top process) except you add cheese- I used a mix of cheddar and fresh Parmesan. You scoop or pipe them onto cookie sheets, bake, and end up with a yummy appetizer that leaves you wanting more. More what? I'm not sure. Maybe alcohol, because that's the suggested pairing. But- since I don't drink, I just figured I would stuff them with something else. My mom suggested jalapeno and cream cheese to make a sort of home made jalapeno poppers (you've had those, right?) Now I hope I don't fail the first Frenchie Friday attempt by adding Mexican flavors but this ended up pretty yummy- Cream Cheese, Green Chiles (that's what was in the pantry), Pimentos, Black Olives, and Salt and Pepper. I scoop it in and then we tried another and thought, "Now it's done." Either way, these are super yummy- and easy to make. And although I clearly took this recipe in a crazy direction I think the moral of the story is that French food doesn't have to be hard or fancy pants. So buy the book already- I can't wait to try more! OMG, I could just sit here and eat up all that gougeres, looks SOO GOOD and the recipe looks pretty easy!!!! Thank you for sharing it! Yummy, looks like a nice treat. Multinational gougeres. Works for me. Next time I bake I will have to fill them. This is going to be a fun group. I love that you made them for sandwiches. And I love the name of your filling! Mine deflated. I think I just didn't bake them long enough, twice. But I baked them as long as the recipe says. Sigh. They still tasted good and are getting eaten. To redeem myself, I'm going to make cream puffs. I my husband loves them. And I'm dying to perfect this little baking task! Your mom rocks. Anything with cream cheese is good in my book. I made them into sandwiches too. That combination sounds fantastic - I think these little puffs are the perfect base for just about anything, really. They look magnifique! Yum. I can't believe you joined another cooking club. You're amazing. How do you find the time??? My kids are lucky if they get their quesadilla grilled on the stovetop instead of nuked! I think Dorie would approve! And I would so love a jalapeno popper that isn't fried that I'm going to have to try your version! I think filling them your way sounds perfect! Nicely done. Love what you did with these! We really enjoyed them too - once again, Dorie is wowing me with her delicious and attainable recipes. I am so sorry about your camera -- I had to send mine off to Canon when it was less than 6 months old and it was very traumatic. Hope it gets well soon!